As most readers will know – I work a lot of hours. I love what I do but some days are better than others. 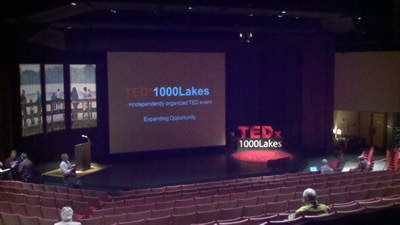 The highlight of my year was Tweeting at the TEDx conference in Detroit Lakes. It was the best. There were about a dozen speakers. The event was super classy. The talks were very thoughtful. You can check out most of my thoughts on the TEDx web site or Tweets – but I will say that I thought Chuck Marohn was a standout speaker. He spoke about the difference between a road and a street. A road gets you from A to B. A street is part of the community infrastructure. You meet your neighbors on a street. You talk to folks on a street. And streets are a vital part of community vitality that have been lost to development. I just realized that I totally blew it not having someone take my picture on the stage. Maybe next year.